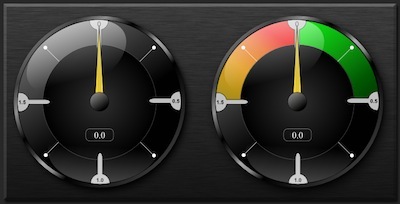 If you’re tasked with creating gauges for a dashboard and you want an example on how to do the graphics, I’ve created one in Inkscape. Inkscape is a free vector application if you are on a budget and can’t afford Adobe Illustrator. I made this while getting a feel for a new dashboard I’ll be working on at work and thought that I’d release it under Free Art License since I’m not going to use it. Each part is in a layer and can be unlocked and edited how you see fit. I hope it’s helpful to someone. Here’s two versions, both are included by selected or deselecting layers. Here’s what they look like. ~ by mohawke on August 8, 2012.